Kimono Diary: September 21-27, 2015 | Ready, Set, Kimono! I realized today that I have a lot of little things kimono-related that happen in my life on a weekly basis, none of them are big enough to justify writing a blog post on, but I still want to share it all with you! After all, studying kimono isn’t just about the nuances of fabrics, seasonal motifs, and how to form a proper ohashori. There’s also all the great little moments that I experience every day. With that in mind, I’ve decided to start a weekly diary covering all the kimono-related small events that happen in my life. So let’s get started! This week was a string of national holidays in Japan called Silver Week. Basically, it’s a shorter version of Golden week that falls in line with Respect for the Aged Day. Get it? Silver hair? Older people? Yeah. I groaned too when one of my students pointed it out to me. My husband and I made a day trip to Himeji Castle, but there was a two and half hour wait to get into the castle, so we went to the gardens next door. They were absolutely gorgeous and I got some great pictures of different kimono motifs that I didn’t have before. I’ve added pictures of real hagi and kikyo to their respective entries in the motif section. There was also a wonderful tea house in the garden, and of course I couldn’t pass up the opportunity to have tea. I wasn’t wearing a kimono, but I couldn’t help but admire the kimono of the women serving the tea. If I can’t wear one, looking at one is the next best thing! I wish I could have gotten a picture of the teahouse, but I always feel so awkward taking photos during a tea ceremony, so I never have any! But here’s a consolation prize, a nice picture of one of the gardens! 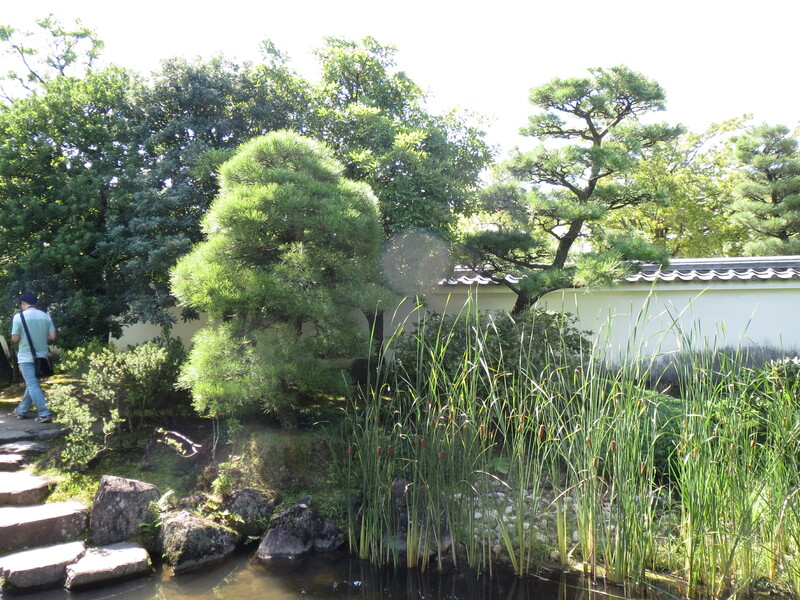 kokoen gardens, right next to Himeji castle. After Himeji, we spent the afternoon in Osaka wandering around, and wandered right past a small kimono shop. From the outside, it looked like an expensive store that only sells new pieces. In other words, not the kind of shop that I will frequent because they’re just too darn expensive! But low and behold, they had a stand of clearance items out front for 1000 yen each. 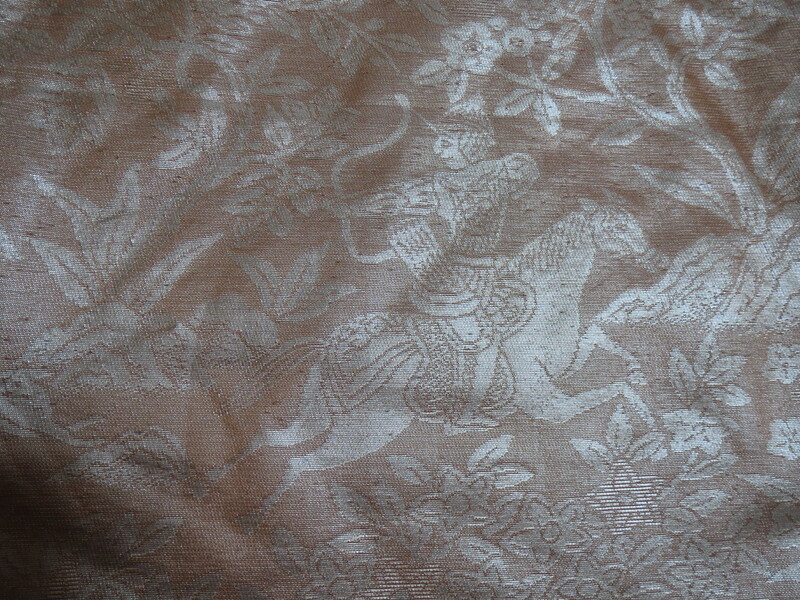 I walked away with two new oshima tsumugi kimono and a fukuro obi with an awesome motif that looks like a middle eastern man from a previous era hunting rabbit on a horse! I was a happy girl for the rest of the day! The kimono are too small for me in the yuki, but I just learned how to extend the yuki in my wasai classes, so it’s a good chance to practice. The shop worker was worried about the fit, and almost fell over in shock when I told her I was learning wasai and would take care of it. 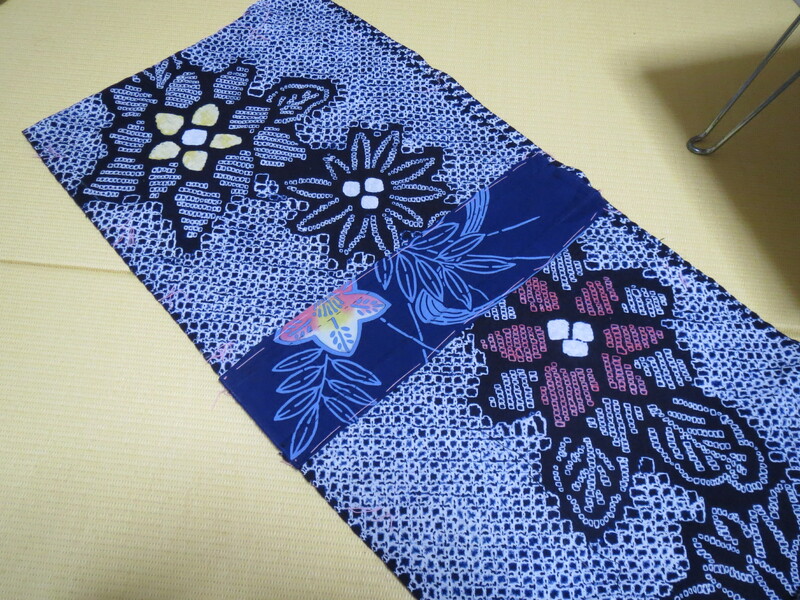 A close-up view of my favorite of the two tsumugi kimono. On Friday, I spend the day with a friend of mine editing a new video. I know very little about video editing, and she has a pretty successful youtube channel herself, not to mention the skills and willingness to help me. (GirlGamerGab, if you’re reading this, THANK YOU!!!) It’s taking about four or five hours to edit three minutes of video, and the video is over ten minutes, so It’s going to take a while. Basically, it’s looking at kimono in pop culture and talking about how accurate they are. I’m hoping that it’ll become a series, and the first one should be ready by the end of next month. I had another wasai lesson on Saturday. 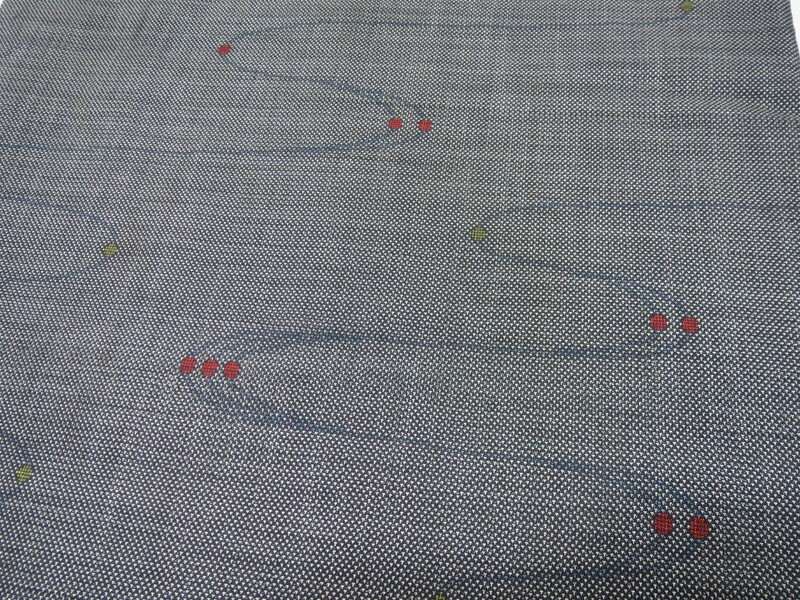 Right now, I’m working on a shibori yukata that is too small on me in every way possible. I had to unstitch every panel and put them back together with a gusset in the middle to make it longer. When it’s worn properly, the gusset will be hidden by the obi. Even though I trust my teacher implicitly, I still had a mini heart attack when I made the first cut into the yukata panels. Especially since we measured everything three times to make sure that it was being cut in the right place! My yukata with the gusset inserted. My homework is to put in the permanent stitches and remove the pink basting stitches. That’s it for this week! Hope you have a good kitsuke week!